This Marcos affords a glimpse back to the brief, unique era when these hand-crafted sports cars featured plywood as a stressed member in the chassis to confer amazing lightness, just like the `wooden wonder' De Havilland Mosquito two decades before. No surprise, as company co-founder Frank Costin had worked on the fast fighter-bomber during WW2, though the GT was in fact designed by Dennis Adams. Started by Costin and Jem Marsh in 1959, Marcos' core values revolved around maximum efficiency from the lightest weight and slickest aerodynamics to promote performance that belied their cars' modest power outputs. The 1800 GT was introduced in 1964 to rival the popular MGB. Powered by a Volvo engine and featuring a de Dion rear suspension, it was both light, scaling just 770kg, and swift, its 115bhp allowing the same number of mph, 10mph faster than the rival B, and 0-60mph was available in just over 9 secs. Production lasted just five years, as in 1969 the car received the 3-litre straight-six Volvo engine and a new tubular steel chassis. This particular example was exported new to the USA and remained there for more than 30 years before relocating to Sweden where it was reconfigured using a new plywood chassis into a FIA-specification competition car. 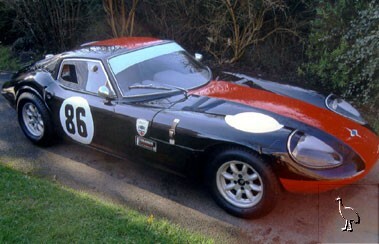 After racing for several seasons, the Marcos was brought to the UK in 2005 and reportedly treated to "an engine overhaul by David Methley with all the right bits". Finished in black with a prominent red centre stripe, the coupe is described by the vendor as being in "very good" condition with regard to its engine, gearbox, interior trim, bodywork and paintwork, while he rates the electrical equipment as "all functioning". As a 1965 car, the Marcos is eligible for many prestige events both in the UK and abroad - such as HSCC Historic Road Sports Championship, Masters Cloth Cap series and the GTC challenge.